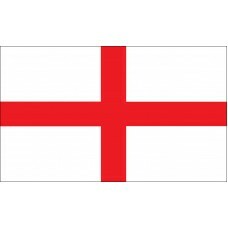 Shop for authentic replica St. George's Cross flags. Our St. George's Cross flags are constructed of durable nylon with a canvas heading and offered in five sizes. The St. George's Cross Flag is one of the most recognizable in the world, and forms part of many other flags. It consists of a white background with a red cross covering its entire height and width. Its design is thought to date back as far as the 12th Century, when it was used to identify forces and civilians in the conflicts now known as the Crusades. The word "crusade" relates to crux, which is Latin for cross. The cross motif is a reference to the crucifixion of Jesus of Nazareth, also known as Jesus Christ. Its importance in the Crusades was as a clear symbol of identity, opposed to Muslim forces in the Holy Land, including Jerusalem. The Crusades were a series of attempts to gain control of these lands for Christian rulers. The St. George's Cross in particular, became extremely popular in Christian Europe from that time. The man who eventually became known as Saint George is believed to have been born in the Near or Middle East in the 3rd Century. He became a Roman soldier and was himself a devout Christian. His family heritage was Greek. He was a member of the Praetorian Guard of the Roman Emperor Diocletian. Diocletian later ordered a persecution of Christians in the Roman Empire. Saint George was given the chance to renounce his religion but would not. This led to his execution, on April 23rd 303. 23rd April is celebrated as St. George's Day in many communities across the world to this day. Saint George is revered in many religious dominations as a hero and martyr. Due to the time of his lifespan, his origins and the development of religious beliefs, his name is held in huge esteem across many cultures. He is a saint in the Roman Catholic, Eastern Orthodox, Anglican, Oriental Orthodox, Church of the East, Lutheran, and Umbanda religions. Saint George is also regarded as a prophetic figure in some Islamic texts. The Cross of St. George was adopted by many states during and after the Crusades. It still features in the flags of Barcelona, Genoa, Milan, and many other municipalities. The country of Georgia, former part of the Soviet Union, is named after the man, and has the St. George's Cross as a central part of its national flag. The main reason the St. George's Cross is so well known is because of its use by England, and later the United Kingdom. First adopted by Richard I of England during the 3rd Crusade, it was later established as part of the Royal Standard by Edward III in 1348. From then, the St. George's Cross began to be associated with England. It formed the basis of the Union Flag of 1707, better known as the Union Jack. This was a combination of the crosses of St. George and St. Andrew, Patron Saint of Scotland. 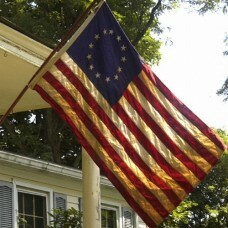 This formed part of the Grand Union Flag of the new United States of America.